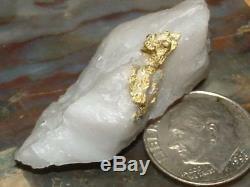 NATIVE GOLD QUARTZ SPECIMEN from the MOTHER LODE. R uler is 1/4 wide (6 mm). 10 cent coin is 17 mm in diameter. S pecimen weight: 10.2 G ram - 157.5 G rains (Troy). S ize: 40X19.7X17.9 mm. 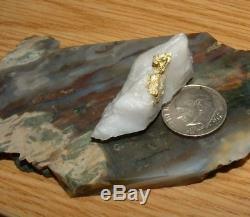 I f you've an eye for gold straight from the earth, check out this white rock from the Sierra Nevada Mtns. This specimen comes from California's Original Sixteen to One Mine. Thickly-concentrated, shimmering gold struts it's stuff atop the albino mother rock. 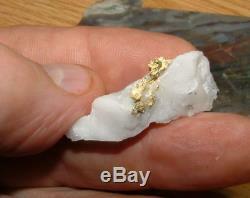 If you ever wanted a sample of gold ore demonstrating'the nugget effect', here is one. The auriferous zone holding the visible gold shows through on both large, main sides. It takes a lot of effort to find gold whether it's placer or pocket gold. From my perspective, there's really no such thing as an'ugly nugget' or gold specimen. Each one is beautiful in it's own way. I guarantee the gold growth here is a natural occurrence. 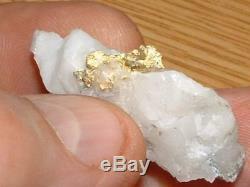 All my specimens show visible gold and are authentic gold quartz specimens. I don't paste'pounded gold' or spray gold-colored paint on barren rock. Refractory ores, which need to be heated and run through special processes to release the minute amount of gold locked up inside, aren't usually my thing. When I do sell sulphides, you'll be able to see gold associated with the pyrites. You won't need to crush and treat my rocks with cyanide solution to get at the gold. We're not dealing in micron gold. I deal in genuine high-grade, naturally-occurring gold quartz with visible gold, both as specimen and as jewelry-grade slab. Such rich rocks and lapidary rough are hard to find and expensive to obtain. I poured through old mining dumps for years looking at orange-yellow-rusty rock through a loupe, but I never found a piece with visible gold. Hydrothermal solutions carrying gold and silica crystallized into veins of gold quartz. This specimen comes from one of the many vein systems sourcing the immense placer deposits of the Sierra Nevada Mtns, the famed Mother Lode. 15.43 GRAINS = 1 GRAM. 31.103 GRAMS = 1 TROY OUNCE. 24 GRAINS = 1 PENNYWEIGHT (DWT). 20 DWT = 1 TROY OUNCE. 480 GRAINS = 1 TROY OUNCE. We leave no stones unturned insuring our customers get what they bargained for. If you're not satisfied with this item, contact me. One method used to mine desert gold is a device (some think of it as an instrument of torture) better known as a dry-washer. By some, such machines might be called'air jigs'. A bellows-type apparatus for collecting gold in like manner might be labelled a'puffer belly'. One other variety of dry-washers, the electrostatic-type, doesn't'puff', however, it'blows'. To use a dry-washer, first determine if the material you're wanting to run is dry and loose enough to be processed efficiently. Even when sediments are completely dry, you wouldn't think hard-packed clay or caliche could be run through a drywasher, but surprisingly, once consolidated minerals as aggregate are broken up out of the pack, most larger gold pieces can actually be separated from the dirt. Now, we're not talking about metal detecting here. This methodology uses the principle of SG (specific gravity) to force gold into separating from dirt/gravel/sand/clay et al. Of course, not all clays or caliches are created equal. Certain clays can be as hard or harder than adobe bricks. Some caliches may be comparable to concrete/calcrete. Consolidated alluvials like these need to be pulverized/milled up to free any gold held inside. Extremely wet ground also poses issues. It needs to be spread out in the sun for drying. The acts of screening or running material through a drywasher may also help to accomplish the same purpose. Ideally, the rule is: the dryer and more unconsolidated, the better. It's not always a lost cause, however, when the ground seems too hard-packed or wet to run. If a spot looks favorable, set your drywasher up and stabilize it. Then, start conveying the dirt, clay, sand, or gravel (by shovel or bucket) onto the screening section of your machine (the grizzly). Sediments classified by the grizzly drop into another section of the apparatus known as a'hopper'. If your drywasher is operating correctly, o nce the hopper is full of dirt, activation of your machine should cause down-sized material to drop onto a concentrator tray where it feeds downward at a slight slope (ideally, around a 15 to 30 degree pitch). The optimum angle depends upon the type and condition (wet or dry) of gravels being processed. Inside the tray are a series of riffles. Acting not unlike catches or cracks in real bedrock, these serve to catch and hold the gold. Riffles may be fastened permanently in the tray or be removable. This process varies slightly from machine to machine. Principally gold (if there is any) and fine-grained black sands (assorted iron minerals) are separated from the paydirt in this manner and become concentrate. Panning, or the use of some other final cleanup method, comes afterwards. Thanks for checking out our digs. G old of E ldorado 1-14-13. The item "CALIFORNIA GOLD QUARTZ SPECIMEN NATURAL GOLD NUGGET 10.2 GRAM GOLD IN QUARTZ" is in sale since Wednesday, September 26, 2018. This item is in the category "Collectibles\Rocks, Fossils & Minerals\Crystals & Mineral Specimens\Precious Metals". 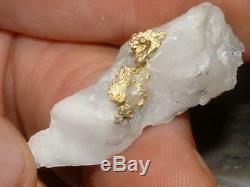 The seller is "egm947" and is located in Banks, Oregon. This item can be shipped worldwide.